At last, outgoing Pennsylvania governor Ed Rendell has started making sense. Too bad he's only talking about football. Upset by the postponement of the December 26th Philadelphia Eagles-Minnesota Vikings game, Rendell, an Eagles' fan, complained that a blizzard was no justification to call off a game that was meant to be played in the elements. The NFL's decision, he hypothesized, was part of the "wussification of America." He's right about that, but he's missing the bigger picture completely. If Rendell is really concerned about the wussification of America, he should ask himself who is more responsible for it -- the NFL, or the Democratic Party to which he belongs, and of which he was national chairman for a year and a half. It's Rendell's Democrats, after all, who promise to provide for Americans' every need, and think it terribly unfair to expect people to earn a living, or "fend for themselves," as they put it. They demonize ambition and enterprise, while taking pride in the number of people they can make dependent on public assistance. Rendell's party doesn't even want us to develop a defensive missile shield. They claim to be on the side of peace, but won't pursue a chance to render long-range nuclear missiles obsolete, because that would upset all the people who want to reserve the capability of firing missiles at us. After the Soviet Union fell, the Democrats used the concept of a "peace dividend" to raid the Pentagon budget to fund liberal domestic initiatives. By linking the two, they could whine that any new defense spending would somehow deprive "The Children." It is also Democrats who control our public school system, which is so wussified that it perceives boyhood as some sort of behavioral disorder. In many of these liberal government schools, a child risks suspension if he draws a picture of a gun, or says the word "bang." Some of them forbid the use of red ink, because it might hurt the children's feelings. To acclimate the kids to a culture of victimhood, they keep virtual armies of counselors on standby. Democrats' judicial appointees have allowed people to sue restaurants for selling them food, because they presume that grown men and women are not responsible for any facet of their lives, including their eating habits. Rather than face the wrath of the liberal judiciary, manufacturers are compelled to use warning labels that assume total helplessness on the part of the consumer. What would America's founding fathers think if they saw us worrying about swallowing the moisture packets from inside our shoes? At least the football game was called off because of a blizzard that was actually happening. Thanks mostly to Rendell's party, and its 2000 presidential candidate, Al Gore, we're about to cancel Western civilization because of the nonexistent phenomenon of manmade global warming. The greenies who dictate the Democrat agenda are constantly thinking of ways to combat this mythical menace, by reducing America's standard of living. We are expected to go along with this, because we saw a picture of a supposedly melancholy polar bear on the internet. Take a look at both parties' presidential icons. Within one decade, we went from Ronald Reagan ("We begin bombing in five minutes") to Bill Clinton ("I feel your pain"). The U.S. hosted the Olympics in the middle of each man's presidency. Our 1984 Olympic mascot was the fittingly nationalistic Sam the Eagle. 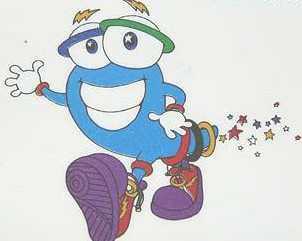 The 1996 mascot was something called Izzy, an androgynous blue blob designed not to offend anyone, except that for some reason, it emitted stars from its posterior. If Rendell's home football team follows suit by changing its name from the Eagles to the Izzies, then maybe he'll finally get the point. If America has become wussified, then the Democrats have been the wussifiers, and Ed Rendell has served as chairman of their wussification committee. If he didn't realize that his actions would someday indirectly ruin a football game, he simply wasn't thinking far enough ahead.